From the political and religious turmoil of that period, two major religious parties rose above the others to gain political and social dominance in Judaea. • From the Hasidic school came the Pharisees (who later evolved into the Talmudists). 1. The exact time of the day on the 14th of the moon of Abib (also called Nisan)1 that the Passover lamb was to be slaughtered. 2. On which day, the 14th or 15th of Abib/Nisan, one was to eat the Passover supper. 3. 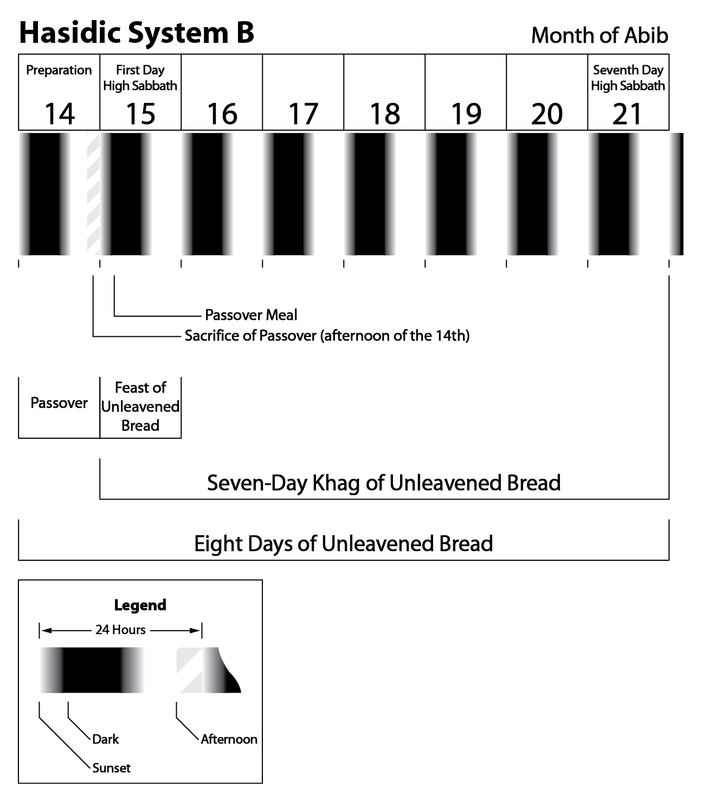 Which days represent the seven days of Unleavened Bread: the 14th through 20th or the 15th through 21st days of the first moon. According to the school of the Pharisees—an offshoot of the early Hasidim,2 from which also descended the Essenes, Zealots, and others—the lamb is to be slaughtered in the afternoon of the 14th and then eaten after the sun has gone down, during the first part of the 15th (the ancient legal Hebrew day beginning at sunset).3 The seven days of unleavened bread extended from the 15th until the end of the 21st day of the first moon. The Sadducees, being supporters of the system used by the old Zadok priesthood, were largely made up of aristocratic priests and their families. They were established among both the Jews in Judaea and the people in Samaria (the Samaritans). Additionally, the Sadducees held to the Aristocratic view that the lamb was to be sacrificed at twilight, just after sunset and before dark, on the 14th, and then eaten that same night (still being the 14th). The seven days of Unleavened Bread extended from the 14th until the end of the 20th day of the first moon. Their practice was suppressed as a state observance in Judaea by the Pharisees in the first half of the first century C.E. Centuries later, the Sadducean view of when to sacrifice the lamb and the Pharisaic idea of when to hold the Passover supper and seven days of Unleavened Bread were combined to form a third interpretation, one which was adopted by the Karaites and neo-Samaritans. According to this third method, there is a common day, which ends at dark, and a legal day, which ends at sunset. The Passover lamb is sacrificed during the last part of the common day of the 14th (i.e., between sunset and dark) and then eaten on the night of the legal day of the 15th. Under this view, the sacrifice of the Passover lamb actually takes place at the beginning of the legal reckoning of the 15th day of the first moon. All subsequent views on just how to keep the Passover and the seven days of Unleavened Bread, including those advocated by different Christian groups, are ultimately premised upon at least one or a combination of these understandings. The heart of the Jewish debate centered upon two different understandings of a statement, three times repeated in the Pentateuch, that the Passover lamb was to be sacrificed in the time period called “בין הערבים (byn ha-arabim),”5 after which, at night, the Passover supper was to be eaten. The word arab literally means “the intermixings of light and dark.”7 What this intermixing of light and dark exactly refers to is a matter of much controversy. One period of ערב (arab; intermixing of light and dark) is the time when the sun disc has gone down and the sunlight left at sunset mixes together with darkness. Light fades, forming the dusk or twilight of evening. Though a few would argue that this arab is merely a point in time at sunset, most apply the term to the entire period from sunset to dark. Most would also agree that this one arab is at least connected with the period following sunset. For simplification purposes, this study shall utilize the following labels to identify each Jewish system. System A: The first view is that of the Aristocratic school, represented by the Aristocratic priests, Sadducees, and early Samaritans (see Chart: System A). The day is counted from sunset to sunset. The time of arab, also called byn ha-arabim, being the time when the Passover lamb was sacrificed, is counted as the period of twilight lying between sunset and dark. The Passover supper is eaten at dark, after the evening’s twilight, on the 14th day of the moon of Abib. 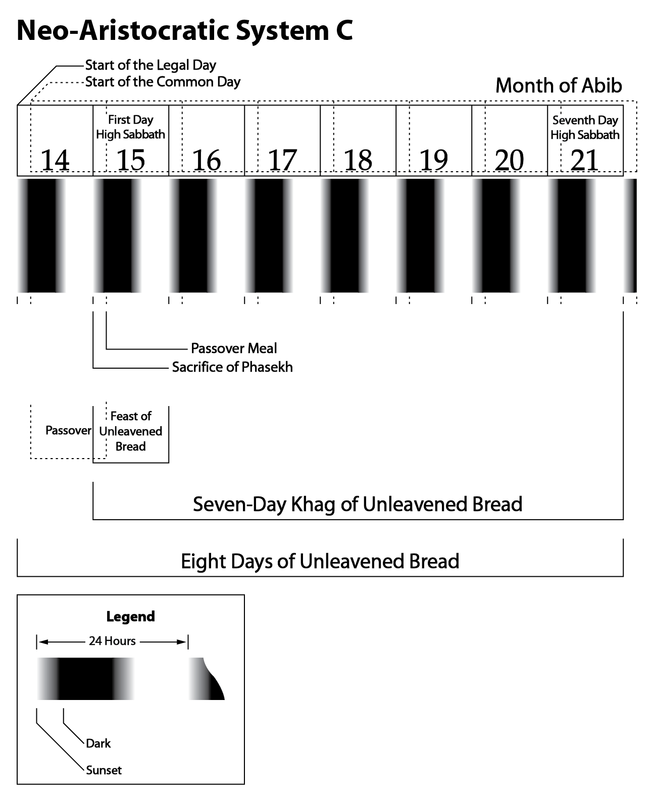 The seven days of eating unleavened bread also begin with sunset, at the very beginning of the 14th of Abib, and continue only until the sunset which marks the very end of the 20th of Abib. The 14th of Abib and the 20th of Abib are both sabbathons (high Sabbaths). System B: The second school is represented by the Hasidic groups like the Pharisees, Essenes, and Zealots (see Chart: System B). The day is counted from sunset-to-sunset. There are two periods of arab. One form of this system counts the first arab as lasting from the ninth hour (3 P.M.) until sunset, being the last part of a day, while the second arab is represented by twilight after sunset, being the first part of the next day. The Passover lamb was sacrificed at the ninth hour, calculating that this point in time was the byn ha-arabim on the afternoon of the 14th of Abib. The second form of this system calculates the first arab from noon until the ninth hour (3 P.M.) and the second arab from the ninth hour until sunset. Still another variant has the second arab continue until dark. Regardless of whichever form it takes, the basic tenet of the Hasidim is that there is an arab that ends the day and the time of byn ha-arabim is in the afternoon before sunset. According to System B, the Passover lamb is sacrificed during the afternoon of the 14th of Abib and the Passover supper is eaten just after the beginning of dark on the 15th day of the moon of Abib. The seven-day Festival of Unleavened Bread lasts from just after sunset at the beginning of the 15th of Abib until sunset at the end of the 21st day of Abib. The 15th and the 21st are high Sabbaths. This system originated among the ancient Hasidim and was later made popular by the Pharisees and their spiritual descendants the Talmudists. System C: The third school, represented by such groups as the Karaite Jews and neo-Samaritans, was an amalgamation of the Aristocratic and Hasidic opinions (see Chart: System C). The day is counted in two ways. There is a legal day, which extends from sunset to sunset, and a common day, which extends from dark until dark. Arab and byn ha-arabim represent the period of twilight between sunset and dark and is the period that overlaps the legal day with the common day. Under this system, the 14th of Abib, the day on which the Passover lamb is to be sacrificed, is counted as a common day (from dark to dark). The lamb is sacrificed at arab (twilight) at the end of the 14th of Abib (also being the first part of the legal day of the 15th). The Passover supper is eaten just after dark on the legal day of the 15th. The seven days of Unleavened Bread are counted from the end of the 14th until the end of the 21st day of the first moon. The 15th and the 21st, legal reckoning, are high Sabbaths. These three Jewish schools of thought have in turn been manipulated into several arrangements, each intended to explain just how and when the Passover was to be sacrificed and eaten, and on which days the high Sabbaths should fall. Obviously, there can only be one original and correct usage of the expression byn ha-arabim and only one correct practice of the Festival of Passover and Unleavened Bread. It will be the object of this study to find out which system was the original and intended construct of Scriptures. The day of Pentecost was calculated as the 50th day from this point. The meaning of the word Sabbath as found in this verse became the source of much contention. • The Aristocratic view held that the Sabbath referred to in Leviticus, 23:11, was the weekly Sabbath. The omer wave offering, therefore, always occurs on that first day of the week which falls just after the festival day of Passover. The 50th day starts from this point. Pentecost day likewise always falls on the first day of the week. • The quasi-Aristocratic view also argued that the Sabbath referred to is the weekly Sabbath. Yet in this variation, the omer wave offering occurs on the first day of the week falling just after the end of the full seven days of Unleavened Bread. Pentecost is 50 days later and always on the first day of the week. • The Hasidim saw the Sabbath of Leviticus, 23:11, quite differently. They understood this Sabbath as referring to the high Sabbath festival day of Passover, which for the Hasidic Jews is Abib 15. The omer wave offering, therefore, always occurs on the 16th of Abib (Nisan), the day after Passover, no matter which day of the week that might be. Pentecost always falls on the same day of the week on the 50th day from that point. • The quasi-Hasidic view also believed that the Sabbath referred to is a high Sabbath festival day. Yet unlike their counterparts, they believed it was the sabbathon on the last day of the seven days of Unleavened Bread. For the Hasidim this date is Abib 22. The omer wave offering, therefore, always occurs on Abib 23, regardless of which day of the week it falls. Pentecost always falls on the same day of the week on the 50th day from that point. Pentecost leaves us with the same dilemma presented by Passover and the seven days of Unleavened Bread. There can only be one original and correct usage. • What was the historical and cultural context that helped develop these different views? • Who were the spiritual fathers of these different views? • What was the reasoning used to support their respective positions? Our search will culminate with the one correct view of how to celebrate the Festival of Passover and Unleavened Bread and the Festival of Pentecost. During the process, we shall examine the historical and cultural context that gave birth to the differing opinions. We shall also examine when and why the advocates of the Hasidic views were able to politically suppress the Aristocratic understandings. This background will be followed with the evidence documenting the practices and reasonings used by the Hasidic (System B) and Aristocratic (System A) schools. In addition, we shall examine a late compromise which combined the Hasidic interpretation of the seven days of Unleavened Bread with the Aristocratic view of byn ha-arabim (System C). With all the evidence being considered, we shall then examine the various views advocated by the ancient Jews for counting the days to Pentecost. Time for another break everyone. We’ve got a lot of territory to cover so when you’re ready please continue with 8. Passover – The Dark Period I. 1 That the Hebrew moon (month) previously named Abib was, after the Babylonian exile period, called Nisan, see HBC, pp. 33–40; NBD, p. 937. 3 “Sunset is the moment when the entire sun disappears below the horizon” (EJ, 5, p. 1376). The Hebrew legal day, which was controlled by the moon phases, begins when the sun has set and the new moon became visible (see THP, p. 131, and n. 3; ADB, 4, pp. 765f; EWJ, pp. 15f, and n. 2, pp. 26f; HBC, pp. 9f). Those defiled and unclean had need to bathe and then at sunset, at the beginning of a new day, were once again declared clean (THP, p. 199, n. 6). 4 Regarding the Aristocratic view of the early assemblies following Yahushua the messiah, we will provide a detailed discussion in a forthcoming post later in this series. 5 Exod. 12:6; Lev. 23:5; Num. 9:3-5. 6 The term בין הערבים (byn ha-arabim) is derived from the following: (1) בין (byn): “interval, midst . . . between, among, within” (HEL, p. 33; SEC, Heb. #996, 997); (2) ה (ha): “def. art. ὁ, ἡ, τὁ the . . . demon. pron. this” (HEL, p. 64); and (3) ערב (arab), plural ערבים (arabim): “to braid, i.e. intermix,” “the idea of covering with a texture,” “to grow dusky at sundown:—be darkened,” “to commingle,” “dusk,” (SEC, Heb. #6148, 6150, 6151, 6153); “TO SET, as the sun . . . to do at evening . . . evening” (GHCL, pp. 651, 652); “became dark . . . intermixed with . . . evening,” (HEL, p. 201); “evening (sunset)” (CHAL, p. 282); “a raven (from its dusky hue)” (SEC, Heb. #6158). We should add, ravens in the Middle East are often dark grey in color. For the reason that their color is a mixing together of both light and dark they are called arab. 7 See above n. 6. 8 CBTEL, 7, p. 735. 9 DBC, 2, p. 714, n. k.
10 NJB, p. 95, n. c.
11 See above n. 1. 12 Mal. 3:6; Heb. 1:10-12, 13:8. This entry was posted on 01/10/2013, 12:48 pm and is filed under Calendar, Easter, Feast Days, Jews, Passover, Pentecost, Religion, Unleavened Bread, Yahweh. You can follow any responses to this entry through RSS 2.0. You can leave a response, or trackback from your own site. Looking forward to the “detailed discussion” of footnote 4! We still have a ways to go kalosfruit. Just wanted to know that I have been enjoying ALL your articles here, and have printed out a few for my preacher to read. Thank you for all your hard work and sharing your thoughts/research on these matters. I’m doing a lot of study cramming … between your site, other sites, and bible study at church. Learning a lot and wishing I can done this years ago! It is exciting, Barbara! And it’s rare to find people willing to set their minds to this task. How is your preacher taking the information? I will be on the lookout for your comments.